A few weeks ago my friend Jim’s wife was telling someone about Jim’s favorite activities. She said his two favorite pastimes were to talk about senseless stuff with his friend Dave (me) and to play video games. When she told us that, we pretty much agreed. Jim has just about every video game system ever made, and a whole bunch of games. 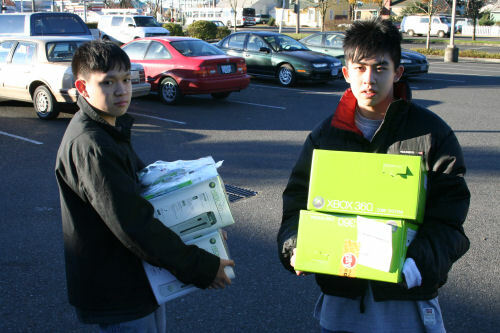 So, when the X-Box 360 was about to be released, you know he had to get it. 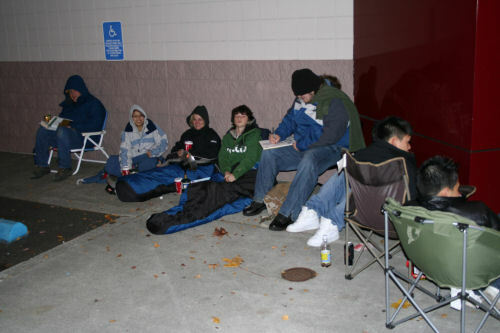 So, on Monday the 21st of November, 2005, I was planning to hang out with Jim and was on my way over to his house when he called and said that people were already starting to line up at stores across the city to try to get one of the few 360s that were being released the next morning. He said that he would probably have to get in line pretty soon, and this was around 5:45 that afternoon! So, I finally arrived at Jim’s house and I went in and saw Jim’s wife, Jolie, before I saw him. She said that her husband was crazy, and I agreed with her. He was in their bedroom calling all the different stores trying to figure out how many units each place would be selling and how many people were already lined up. It seemed like the lines were almost full everywhere except Circuit City, so he decided to go get in line there, and I decided to stay with him. So, we grabbed some quick dinner and headed over to get in line. When we arrived there was no one in line yet, so we went in to talk to the employees about how they were going to handle the release. They claimed to know almost nothing. All they could tell us is that they would be giving out vouchers to those who were in line, and that they would be selling an unspecified majority of the systems as bundles with unspecified games or accessories for unspecified prices. 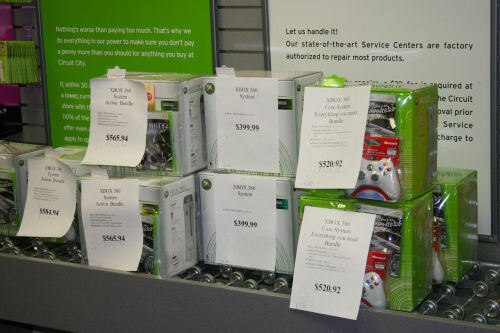 This seemed pretty annoying and unfair, but they said that they would sell a few at the standard price with just the standalone system: the “core” system for $299.99 and the “premium” for $399.99, which included a removable hard drive, a wireless controller and a few other goodies. 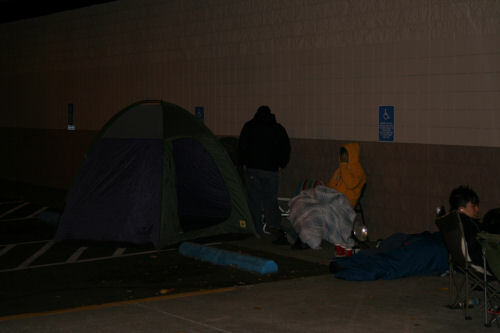 So, Jim got in line to be sure to be the first, and I went to my house to get the camping gear. Jim waited by himself for quite a while as I drove to his house to put his cell phone on the charger and then to my house to gather the gear we would need to spend the night in the freezing cold in front of Circuit City. This was the scene shortly after I came back with the camping gear. I brought my new tent, but as I was starting to set it up I remembered that my cousin Alicia still had my poles, and so I had to make another trip. 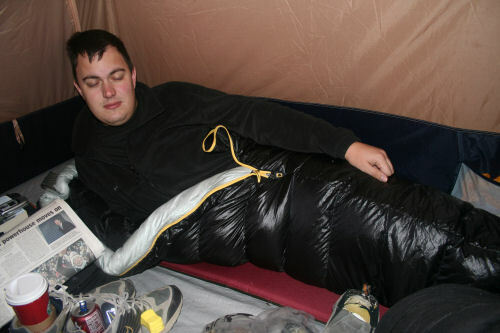 Anyway, I let Jim go get his phone and some other little things he needed, and when he came back I made the second trip home to get a different tent. When I got back from the second run home to get the other tent there were a few more folks who had joined us for the long haul overnight. The guys right next to us (on the right of the photo) were a group of four who were buying the systems mostly to sell on eBay. They were going to keep one or two, but the others they could probably sell for over $1000 a piece and make quite a nice profit. The next couple we never really talked to, but the one guy who you see drawing seemed to be quite the artist. 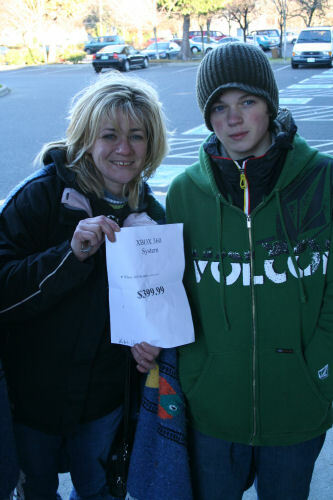 The next two over in the sleeping bags were a mother and son. I'll tell more of their story later on. The next girl was there holding a place for her boyfriend, I think, and the last guy who had a chair was there staying all night to pick one up for his son. I'll talk a little more about him later, too. We quickly got the other tent set up, and I was really glad we used that one. Although it has a little less length inside for tall people like myself, it has a lot more vertical space than my newer tent, so later on you will see that we were able to move our chairs inside the tent to keep nice and warm. Jim currently works for an armored transport company and so he drives around all day, or rides in the back of the truck and picks up and delivers cash all over the city. One of the perks of this job is that you develop relationships with many convenience store clerks who gladly allow you to fill up your 64oz mug for free. As a result of this, Jim is one of the few people in the world who may just drink more pop than me. Oh yeah, and Jim is happily displaying the fact that we got the tent set up, and it's a good thing, because even though it's almost freezing outside, he's drinking his 64oz pop. Jim had a great idea to move the chairs into the tent to keep out of the wind and to take advantage of the tent's ability to keep some heat in. 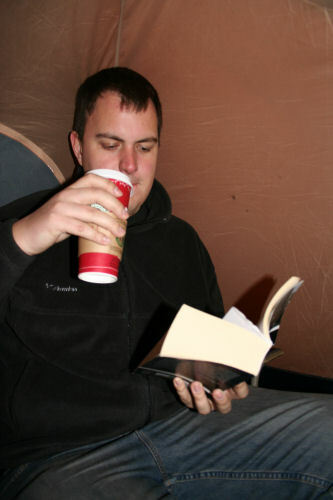 I was pretty skeptical that the chairs would fit with us in them, but they did, pretty comfortably, and we stayed pretty warm as we read our books and sipped our Starbucks. 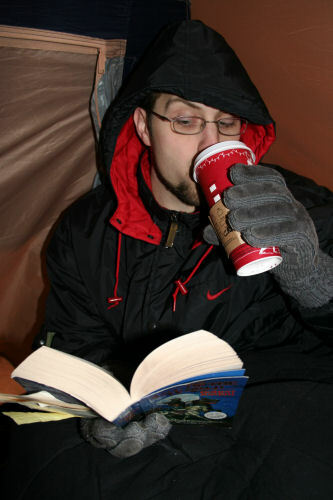 Thankfully there was a 24 hour Starbucks across the street from the Circuit City at Gateway, so we made several trips over there and got tasty beverages to keep us warm and awake for as long as we wanted to be. Jim and I both got some good reading done. 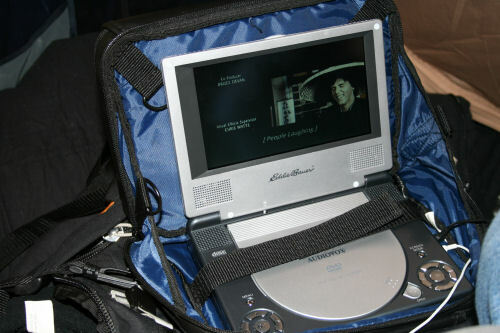 After reading a while we decided to watch a movie on Jim's portable DVD player, so we got out of the tent for a break and Jim got his player and the movie from his car. Meanwhile a few more people had started to arrive. These people also decided to bring a tent. I felt bad for the folks that didn't have one, because it was really cold and windy, but they all toughed it out. Jim and I, along with my friend Phil, enjoy watching senseless movies. If you're wondering what might be considered senseless, think of Monty Python or the movie we watched that night: Kung Pao: Enter The Fist. I would have to say that the latter is the most senseless movie in existence. Jim has probably watched it 50 times. In this photo the credits are rolling, and it's about 2:00am, so we decided to call it a night and tried to get some sleep. I set the alarm on my cell phone to 6:00, so we could get up and get the camp torn down before Jim had to leave for work at 6:50. As you can see, I don't like waking up after 4 hours of sleep. But both of us did eventually get up; Jim helped me tear down the camp and put everything in my car, and then I made a run to Starbucks and McDonalds to get a Chai tea and some breakfast. Jim then took off for work, leaving this important task in my hands for the next few hours. 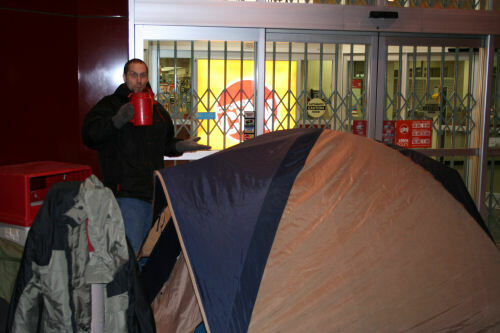 Around 7:30 or so some employees started arriving and everyone began wandering over to the windows to try to figure out what the bundles would be and how many systems would be available. 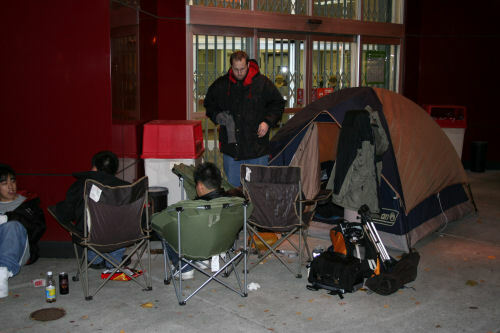 People were counting the numbers in line to see if they had any hope of getting a non-bundled system, or if they would have to pay extra to get what they waited all night for. The prices and numbers were way worse than anyone could have expected. 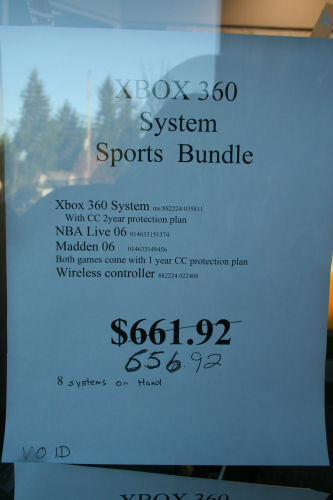 We were guessing that they would have bundles with one game or one controller for $50 more or so, but if you can see, the prices were considerably higher. This was the worst of the bundles, $256.92 more than the premium price! So, what do you get for this astronomical amount? Two games and a wireless controller, $150 worth of products. So where is the extra $100 coming from? It's the wonderful Circuit City warranty that you are forced to buy! One man who camped out had only $400 cash, and he waited all night to get this system for his son. 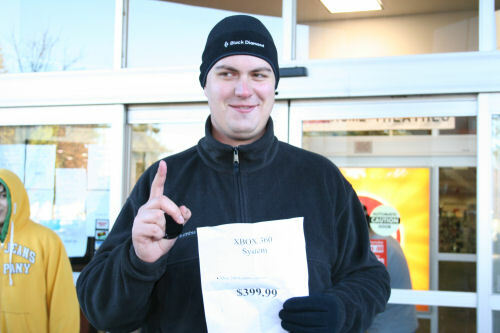 He was at least number nine in the line, and they were only selling five unbundled systems. What was he going to do? He waited all night. Well, Circuit City, The Evil Empire, had a wonderful solution. 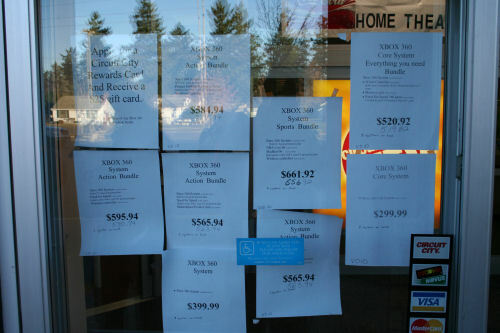 Right after they posted the prices they came around with Circuit City credit card applications. I think that what Circuit City did with these bundles was a very sinister thing to do. When 8:30 rolled around the employees came out with the vouchers and they went through the line asking each person what system or bundle they wanted. Since Jim and I were the first in line, we were able to get the first pick and we got the voucher for premium system, which was what he wanted--the best buy overall. This guy actually pre-ordered the system from Electronics Boutique about six months before the release, but about a week or so before the release they called him up and said he wasn't going to be able to get it when they said he would. So, his mom actually suggested coming out here and waiting all night. Cool, huh? Thanks to the generosity of the four guys inbetween us and them, they were also able to get the premium system and didn't have to buy a ridiculous bundle. Around 9:00am they decided to open the store early for us, and we went to the customer service counter to redeem our prized vouchers. I was very grateful that they at least did this, so it didn't turn into a mad rush when the doors opened to get to the systems before everyone else. There could have been a lot of running and pushing without those little pieces of paper that secured our place in line, and I wouldn't have done that, so Jim probably wouldn't have gotten his system. So yeah, hooray for vouchers. One of the more interesting stories was this guy who worked for InFocus (the people who make the digital projectors). He was actually on the job that morning trying to procure as many X-Box 360s as he could so his company could use them to demo their High Definition projectors. Cool job, huh? He ended up being the last or next to the last to get one, but his company had enough money to buy the pricey bundles that were left. He didn't camp out, but he was there pretty early. 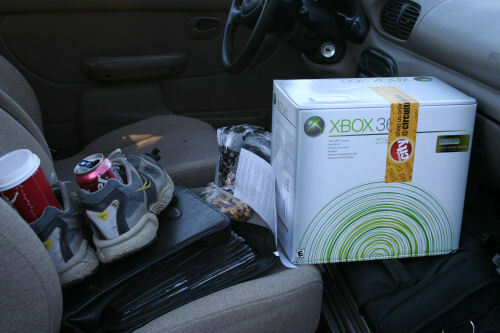 So, around 9:15am I had the X-Box 360 in my car and I could finally go home, or go to work, rather. It was quite the night. Even though it wasn't something I would have chosen to do for my own sake, it was really fun to hang out with one of my best friends and to experience a very unique cultural phenomenon. I think I would even do it again... In fact, I'm sure we will be out in the cold again soon, standing in line as early as necessary around December 8th to get good seats for the midnight showing of The Lion The Witch and the Wardrobe. Mmm...that should be good!